(X) granted ( ) denied ( ) withdrawn with prejudice. Wendy and I were both born in 1980; me in Boston, and Wendy in a large city in Africa. In 2008, we both had a child; I had Teddy, and thousands of miles away, Wendy had a little girl, who I will call "Robin." 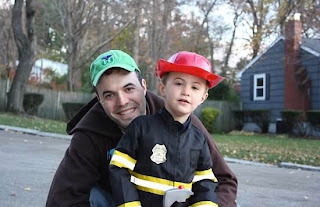 On October 31, 2010, Brian and I took Teddy trick-or-treating around our neighborhood. Here are a few photos from that day, which was just a few months before Annabel was born. Yes, the fire hat is backwards. Teddy insisted that the long part be in the front like it is on a baseball cap. I thought his argument made perfect sense. While we skipped around our neighborhood collecting candy, half way around the world, Wendy was saying a painful goodbye to her daughter and her husband, not knowing when -- or if -- she would ever see them again. She then fled her country to this one, with little more than a few hundred dollars in her pocket and the name and phone number of someone she had never even met. All of this, because she couldn't be safe where she was; all of this because she had peacefully opposed a corrupt government. With certain exceptions (for instance, for those who have committed crimes), the United States provides political asylum to people who are unable or unwilling to return to their home country "because of persecution or a well-founded fear of persecution on account of race, religion, nationality, membership in a particular social group, or political opinion" (that's straight from the federal law). This means that the U.S. will protect these people by giving them legal status as asylees and eventually giving them the opportunity to become permanent residents and years later, U.S. citizens. But first, each individual must prove to an asylum officer or an immigration judge that he or she meets the legal requirements of asylum. Yesterday, we helped Wendy do just that. Wendy is one of the most appreciative people I have ever met. Back in 2011, just a few months after we met, Wendy told me how grateful she was to have found attorneys to help her (her case had been delayed several times when the judge told her to try to find legal assistance). I remember how upset and disappointed with herself she was because she couldn't pay us. I explained to her that our law firm still paid us so she shouldn't worry about anything. The beauty is that Ropes charges big companies tons of money and then charges wonderful people like you nothing; it was perfectly just in my mind. Then I told her that seeing her daughter get off a plane in Boston would be better than any amount of money I could ever be paid. I believed that then and I believe it even more now. I remember a really tough meeting we had with Wendy over a year ago, back when February 5, 2013 still felt like a lifetime away. She was devastated about not being able to work -- about having to wait. And wait and wait until a judge would decide her destiny. 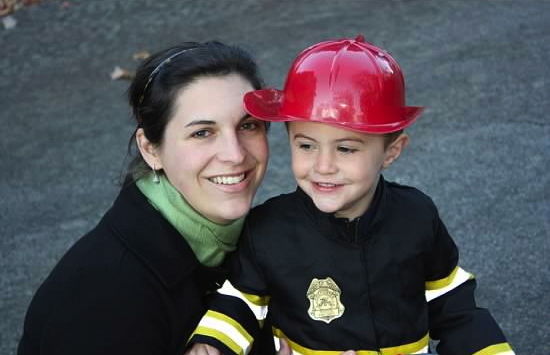 Wendy didn't know if she'd be able to testify about the tragic things she had experienced. She contemplated giving up on her asylum claim to return to her country. If I'm killed, I'm killed, she told us, staring into space, eerily matter-of-factly. I remember telling her that she wasn't doing this for herself; that she was doing this for her daughter. I remember that because it was the one thing I said that day that I know made a difference. When the impossibility of replacing a person is realized, it allows the responsibility which a man has for his existence and its continuance to appear in all its magnitude. A man who becomes conscious of the responsibility he bears toward a human being who affectionately waits for him, or to an unfinished work, will never be able to throw away his life. He knows the "why" for his existence, and will be able to bear almost any "how." And so, for her daughter, Wendy beared the weight of a long and lonely how. There's no doubt that the corrupt government in Wendy's country took away so much from her. Wendy couldn't speak, write, read, assemble, or travel with the freedoms that we take for granted every day. She was brutally abused in ways I can't even write about. When she came to the U.S., practical realities limited her, too. Sure, she could travel where she wanted to. But Wendy wasn't allowed to work while she waited for yesterday's hearing, so she had no money, and it's hard to travel, or do anything really, for free. Everything can be taken from a man but one thing, the last of the human freedoms – to choose one’s attitude in any given set of circumstances, to choose one’s own way. No matter what had been taken away from her, Wendy never let anyone steal this last sacred freedom. She chose her own way -- an optimistic and hopeful one -- and despite the dark details we had to discuss at our meetings, Wendy always found plenty of time to be happy and grateful. We still have more work to do to get Robin and Wendy's husband to this country. But the biggest hurdle has been cleared by that little "X" that I mentioned above. We hope that by the end of 2013, Wendy and her family will finally be reunited. A lot has happened since Brian, Teddy, and I snapped those photos above. But Wendy has not seen her daughter or her husband, or any family for that matter, since that very day. She told me yesterday that she's worried her daughter won't remember her. I assured her that she would, and if she doesn't, Wendy's got a whole lifetime to remind her. Congratulations Tara! You should be proud of yourself. Best wishes for Wendy and her family. Congratulations!!! That is amazing!!! So happy for Wendy!